Join Us at the Renaissance Festival! UPDATE: THE BOOMERANG PARTY BUS TO THE RENNFEST WITH WE LOVE DC AND THE PASSENGER IS NOW SOLD OUT! THANK YOU! Ah, yes, it’s that time of year. The time when you begin to have strange cravings for Steak-on-a-Stick, or smoked turkey leg eaten right off the bone, gnawing away with relish like Henry VIII. 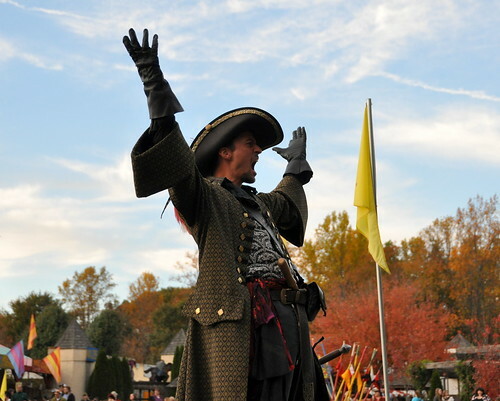 Perhaps you find yourself speaking in an excruciatingly bad English accent, or inexplicably adding “e” to the ends of words like “Shop” or “Old” – well then my friend, it’s time to don thy frippery best and hie thee to the Maryland Renaissance Festival! RennFest is always a blast, and this year we’ve decided to really let our inhibitions run wild with some good olde-fashioned goofy fun. Lots of it. And we want you to come along! We Love DC has partnered with The Passenger and the Boomerang Party Bus to bring you to the Maryland Renaissance Festival this Sunday, October 16th! Tickets are $25 and include both your bus ride to and fro ye old faire and your entry admission! Snap them up on the magickal PayPal. We’ll depart promptly at 11am from The Passenger (that’s at 1021 7th Street NW, milords and ladies) and travel to the Festival in a refurbished school bus replete with music, mayhem and dance poles (Yes, I know that’s an anachronism. But seriously, have you seen The Tudors?). After arrival at the Festival you’re free to wander the Revel Grove, slurp down some oyster shooters, indulge in fried Oreos, beer and bee stings, testing your mad skills at archery or feats of strength, buying chainmail underwear, and just giving in to the kitschy glory that is the Maryland Renaissance Festival. Then our carriage departs around 5pm to hie back to The Passenger just in time for a late, delicious brunch. So please come along with fellow WLDC authors Don, Fedward, myself and the rest of our motley crew as we join our favorite folks from The Passenger on a trip back in time… I may even wear a corset. HUZZAH! Four hours is not nearly enough time to enjoy all that the Faire has to offer. @Kate Given that 2 hours will be spent in line, I agree. Last Sunday I went for the first time and it took about 80 minutes to go the last 3 miles to get in.